This was kinda good. Grandma Lyn, you wouldn't like it. It has miracle whip in it. But the kids liked it because it was sweet. It called for mayo, but we didn't have any, so we used what we had. 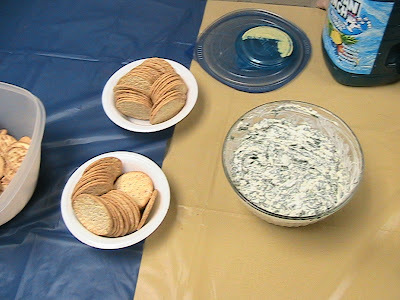 Mix all together and serve with crackers. Not too bad. Not our traditional spinach dip, but it was good. I personally would have liked it better with mayo, but probably because I'm more used to it.